"As it has been since the beginning, the adversary would divide us, break us up, and if he can, destroy us. But the Lord said, 'Lift up your hearts and rejoice, and gird up your loins, and take upon you my whole armor, that ye may be able to withstand the evil day, ... taking the shield of faith wherewith ye shall be able to quench all the fiery darts of the wicked' (D&C 27:15, 17; emphasis added). "Lest parents and children be 'tossed to and fro,' and misled by 'cunning craftiness' of men who 'lie in wait to deceive' (Eph. 4:14), our Father's plan requires that, like the generation of life itself, the shield of faith is to be made and fitted in the family. No two can be exactly alike. Each must be handcrafted to individual specifications. 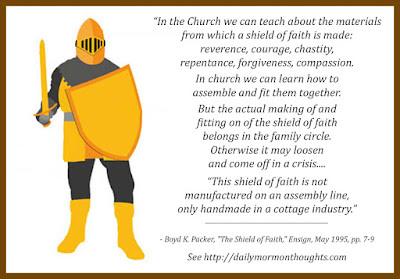 "The plan designed by the Father contemplates that man and woman, husband and wife, working together, fit each child individually with a shield of faith made to buckle on so firmly that it can neither be pulled off nor penetrated by those fiery darts. "It takes the steady strength of a father to hammer out the metal of it and the tender hands of a mother to polish and fit it on. Sometimes one parent is left to do it alone. It is difficult, but it can be done. "This shield of faith is not manufactured on an assembly line, only handmade in a cottage industry. Therefore our leaders press members to understand that what is most worth doing must be done at home. 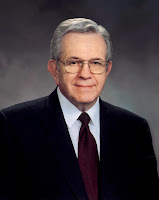 Some still do not see that too many out-of-home activities, however well intended, leave too little time to make and fit on the shield of faith at home." The imagery of "the armor of God" was introduced by Paul in his letter to the Ephesians (6:10-18). He comments, in the words echoed in modern revelation, "Above all, taking the shield of faith, wherewith ye shall be able to quench all the fiery darts of the wicked" (Eph. 6:16). Possessing that "shield of faith" becomes critical in our day, when "fiery darts" seem to be present in abundance. 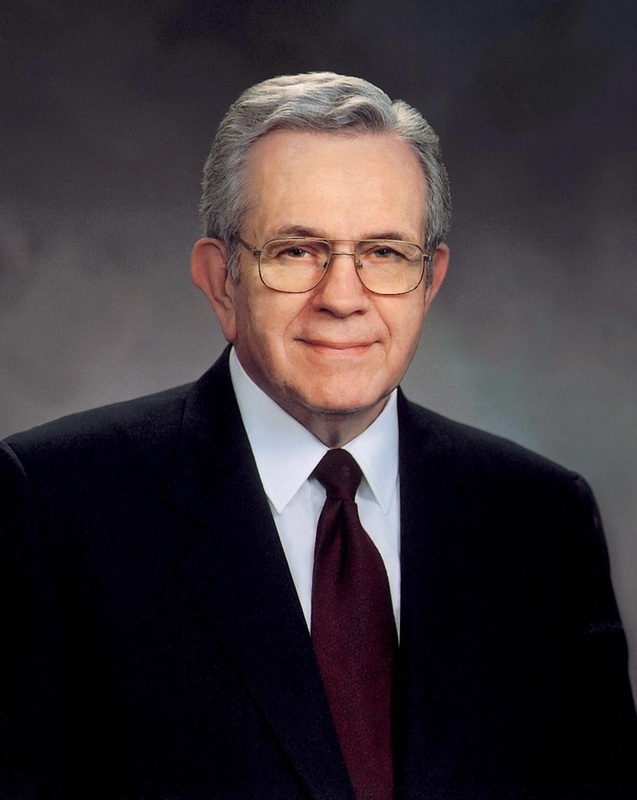 President Packer's message is that the family setting in homes is where the shield of faith is best produced, in that "cottage industry" instead of a mass-production factory. In the ideal home, a father and a mother work together to custom-make the shield for each child, "made to buckle on so firmly that it can neither be pulled off nor penetrated by those fiery darts." Through teachings and example, through tutoring experiences, children must learn how their faith in Jesus Christ can grow, and can be used to preserve strength and safety. And each of us, young or old, must continue to strengthen our own shield, to make sure it is fitted tightly to our hearts and souls.